Where I come from there are three topics that are impossible for the locals to tell the truth about: buck, trout, and merkels. The bucks that are now in the freezer had at least sixteen points and were as big as a full-grown Angus. The native trout that were eaten last night were all at least eighteen inches long. The merkels were so plentiful last week, they pulled ten gallons off the mountain in one day. Now, ask where any of these miraculous examples of nature occurred, and the conversation becomes vague. Terms like “over yonder” and “up past Spruce Nob Point a piece” are about as exact as you are going to get, and even this information is suspect. Pushing for more details will often get you the reply, “Well, I could tell you, but I’d have to kill you.” After you live here a while, you realize this behavior is not a lack of morals but is probably genetically linked to some hunter-gatherer strand of DNA designed to keep the organism alive during times of scarcity. But wait…there is something that many people who are not from my neck of the woods may be confused about. What is a merkel? A merkel is the local name for the morel mushroom. The story behind this name is that a mountain family was saved from starvation by eating these miracles or “merkels”. Call it a merkel, a Molly moocher, a hickory chicken, a haystack, a conehead brain, or any other of a dozen different nicknames depending on your locality; it doesn’t matter. What does matter is that spring is upon us, and the season for the morel mushroom is about to open. This tasty delicacy is prized for its smokey earthy flavor. Hunting them is fantastically fun, but eating them is even better. Four-star chefs prize them for their flavor, so a gallon of these fungal fruits can fetch between fifty and sixty-five dollars. The best part is, they may be in your own back yard. The habitat of the common morel stretches throughout the North American continent. The Peterson Field Guide, Edible Plants of Eastern and Central North America sites that they are found in moist woods, orchards, and burnt fields. However, I have read accounts and heard stories of morels in well-tended suburban and urban lawns. So unless you live totally surrounded by concrete, there could be morels in your neighborhood. If you Google some images of morel mushrooms you will see they occur in a splendid variety of colors ranging anywhere from white to grey to yellow to tan to black. If you are totally unfamiliar with them and are interested in hunting them, make sure that you access the wide variety of images found on the Internet. Not only will it give you an idea of the extent of their variety, it will it help you learn exactly what you are looking for. 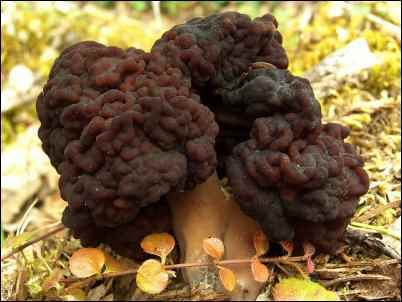 Should you decide to join the fabulously fun hunt remember that proper identification is extremely important because the common morel can be easily confused with the false morel, which is poisonous. That said, when identifying a morel it is important to look for two general things: the cap shape and texture, and if the interior of the whole mushroom is hollow. First, when examining the cap it is important to note the texture. It should be ridged and pitted inwards. 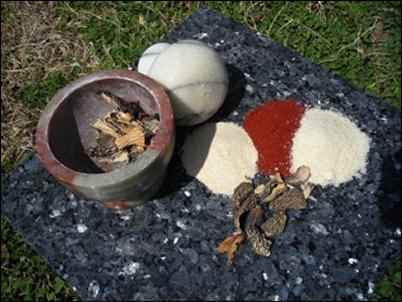 False morel mushrooms are usually described as more convoluted, like a brain, instead of pitted. Second, look at how the cap is on the stem. On most morels the bottom of the cap is attached to the stem. If the cap hangs free, like an umbrella, from the stem stay away from it. If in doubt, toss it out. The second step to making sure a mushroom is a true common morel is to cut it open lengthwise. The true common morel will be completely hollow from the tip of its cap to the bottom of its stem. The inside of the false morel will contain cotton-like fibers or chunks of fungal tissue. So, now that you are armed with information, how do you go about hunting them? If you have never seen a morel in its natural habitat, you may be surprised how beautifully camouflaged their unusual look makes them. On the leaf carpeted forest floor they are practically invisible to the inexperienced eye. Novice hunters can walk through a patch and never see them. So, if you are a first time hunter, the best course of action is to seek an experienced morel hunter who lives in your area and ask for guidance. Although many locals may dodge telling you about their prime spots, they usually love to share their knowledge and show off their skills at finding morels. They’ll have places they feel good about taking you, and their experience with identification, when to find them, the kind of terrain in which morels in your locality prefer, and techniques for actually seeing morels on the ground may be invaluable. The actual season for morels can vary depending on your location. 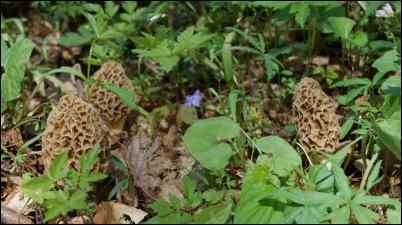 People have reported finding morels as early as February in different parts of the country. Generally, however, the season lasts about two to three weeks and can range from mid-March to May. If you can’t find a local to give you accurate information on when they are up, contact your local extension agent or your state’s nature and wildlife agency. In our area of Virginia, we begin to search using some good old fashioned folklore. When the leaves on the poplar are as big as a squirrel’s ear, when the trillium bloom, and the mayflowers spread their umbrellas, it’s time to go hunting. First, however, you must prepare. In many instances you will be going into the woods. In such cases you will want to dress accordingly. 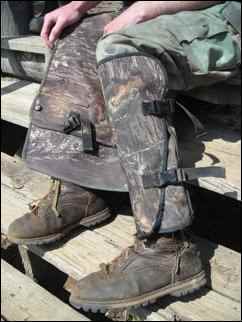 The well-dressed morel hunter wears sturdy walking shoes or hiking boots, long pants, and layers appropriate for any sudden weather changes. In Virginia, there can be a difference of thirty degrees or more between morning and evening in the spring. If you are going on an extended hunt, you want to be prepared for that temperature change, especially if you intend to hike far from shelter. Also, be aware and dress for the possibility of ticks, poison ivy, and brambles. A first-aid kit would be a good idea; shorts and sandals would not. To complete your outfit you will want to accessorize with the all-important morel-collection bag. 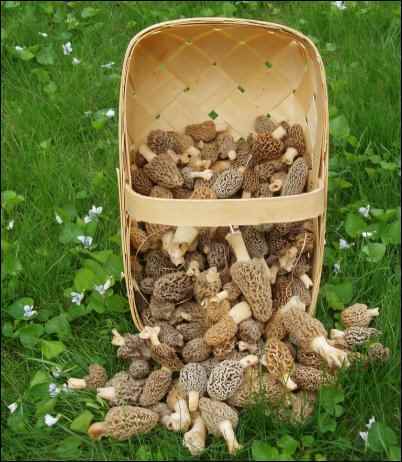 When hunting morels, it is extremely important to collect them in a mesh bag, like a net onion or potato bag or a nylon mesh laundry bag. The reason this is so important, is that morels reproduce by dropping spores. One morel can contain a quarter to a half a million spores. These spores must become airborne and then find the right location to reproduce. Success of reproduction is slim. However, morel hunters will help if they use mesh instead of plastic bags. Morel populations have dwindled over the last thirty years. Although deforestation and pesticides play a part, the biggest culprits are hunters with plastic bags. When plastic bags are used to collect morels the spores are trapped inside the bag with no way out and no way to reproduce. So please use the right sort of bag. Once you are dressed and have your mesh bag ready, it’s off to the happy hunting grounds. In my experience, it has been the woods. We have found morels in a variety of places, but most of what we have found has been in a deciduous forest. Although they grow under a variety of trees, around here they seem to like the tulip poplar. Once we get to where we like to hunt, I go to the trunk of a tulip poplar and squat down. Then I concentrate on the area of the ground that the canopy of the tree covers. Because they are so well camouflaged, they are easy to miss when you are looking straight down at them, so it helps if I can look uphill. If there are morels, I will be more likely to see them popping up from the ground. Then I move through the woods from tree to tree. Many times if I find one, I will find a smattering of them. Usually, my husband finds the first one. When he does we will both spend some time putting it in different places on the forest floor and training our eyes to get used to the pattern and shape. This practice makes finding them easier. We have discovered that, in our area, the black morels arrive early in the season. These tend to be higher on the mountain. Farther into the season we begin to find yellow, gray, white, and tan ones closer to the bottom of the mountain. We have also found that morels do not like areas that have been logged, but they love a mild forest fire. One spring, after an autumn fire burned thousands of acres in our area, we found a mother-load in the burned area. However, the next year there were not nearly as many. This corresponds with reports that, in the 19th century, the Russian government had to outlaw the setting of forest fires for the sole purpose of harvesting morels the next year. From year to year the yield in any one of our favorite spots varies greatly. When your bag is full, or your feet are worn out, it’s time to go home. If you are a first-time hunter, it is a good idea to have your mushrooms checked by an experienced person who can tell you with certainty that what you have found is a common morel and not a false—therefore poisonous—morel. Although some false morels may not have a noticeable effect on a person, they do contain toxins that when taken in large amounts or over several days can produce gastrointestinal upset and loss of muscle coordination. The cardiac muscle can be affected by them and deaths have been reported. Be safe and have your mushrooms checked. Once we get them home, it’s time to decide what to do with them. If our haul is small then we make something yummy with them right away. Because morels contain small amounts of a toxin known as hydrazine, they should never be eaten raw; cooking removes the toxin. Since the arrival of morels usually coincides with the arrival of our asparagus we love to make cream of asparagus and merkel soup. 1 to 1 1/2 c. fresh morel cones (not stems) cut into “coins” (Wash morels and cut crosswise starting at the tip of the cone and working down the mushroom stop at the stem.) Coins will have hollow centers. Wash asparagus and cut off coarse ends. Then cook asparagus and morels in 2 cups of boiling water until asparagus is tender. Drain asparagus and morels but reserve 1 cup of water. Set the morels aside. Cut the tips off the top of the asparagus, chop and add to the morels. Set aside to use as a garnish before serving. Bring the chicken broth, 1 cup of reserved water, and onion to a boil in a pot. Add the asparagus stems and simmer for approximately 5 minutes. Drying morels in a food dehydrator. Use a food processor, immersion blender, regular blender, or vegetable mill to puree. Return the soup to the pot (if necessary) and add the cream or milk and reheat. Add salt and pepper to taste and reheat if necessary. Garnish with morels and asparagus tips and enjoy. If we have a large haul of morels we will dry the rest and save them for other recipes. 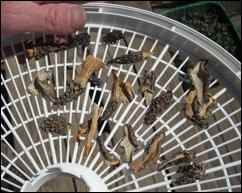 We use the drying racks from our food dehydrator, but do not attempt to dry your morels in a food dehydrator; the spores will clog it. Unfortunately, I found this out the hard way. Cutting the morels in half lengthwise and putting the rack in the sun works very nicely. If it becomes rainy, we bring them inside and set them near the woodstove with a fan blowing on them. If we feel they are taking too long, we will finish the process in the oven. This method has worked very well for us. They can be reconstituted by soaking them in water or milk and then adding them to your favorite recipes. However, we discovered that we like to use our morels in a meat rub that we use before we grill our chicken, steak, and spare-ribs over all-natural wood-charcoal. The combination of merkel rub and grilling gives our meat unsurpassable flavor. Rub meat again with Merkel Rub. Although morels can also be frozen, they can turn mushy when thawed. If you choose to freeze them, place them in a bucket of water. After they have soaked for a few minutes, put them on a cookie sheet and freeze them. Once frozen remove the morels from the cookie sheet and put them in an air tight container. Whether you decide to eat them fresh or store them for later use, morels are marvelous! **Special Note: Be careful of hunting morels in orchards. Toxins used in the pesticides may be in the soil and thus absorbed by the morel in levels unsafe to humans. Unless you know the orchard is a no-spray orchard, avoid hunting in it.